Swim: 1.9km Age group swim start will be a rolling start from the beach. Athletes will swim a 1.9km anti-clockwise, triangular course. It is expected to be a non-wetsuit swim, with race day water conditions averaging at 24-27°C. Bike: 90km Athletes will make their way north on the beach promenade and complete an out and back section before continuing onto the most beautiful Khao Lam Road. The course continues until crossing right on to the motorway side-road towards Bang Phra where one loop needs to be completed around the reservoir on the rolling hills and beautiful woodlands that will keep you cool and shaded from the sun. Participants then head straight back pass Khao Lam Road to T2. The roads are wide with mostly smooth tarmac and low rolling resistance, suitable for achieving a personal best!Run: 21.1km The run course has it all, rolling slopes, flats and a mixed scenery of beach and gardens. The course starts on the beach promenade making it’s way towards Lam Tan and then up Khao Sam Muk Hill where you enter the “Monkey zone”, a famous tourist spot inhabited by a number of monkeys and beautiful cactus gardens where the old fisherman village is located. 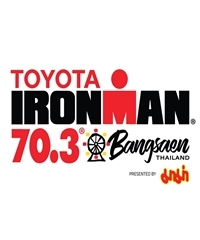 After making three loops around Khao Sam Muk Hill expect a fast finish making your way down to the beach again and the finish line at The Bangsaen Heritage Hotel.